Birds gossip in the trees in our front yard. Two wide maples cast huge shade across green grass and the gray cement made up of driveway and sidewalk. We three sit in this shade with fat pastel chalks in hand. The black concrete begs, a canvas. Grandma makes art: a face, a flower, the word Faith. Toddler’s shirtsleeves are powdery with color as she scribbles a white circle around herself chalk swinging back and forth, up and around. I sit, somehow anxious to put the chalk to concrete, finally drawing a safe little house, a doodle I’ve done time and time again. Grandma skips past safe and crafts a hop-scotch board and gets right to hopping, skirting over her rock, reminding me of the rules. Toddler sits transfixed, as a grin spreads. She’s excited to see that Grandma can bounce. In response tiny arms go up, as if reaching to grab the sky and pull herself into a jump. She stretches out tight wanting so badly to join the bounces. Trying. And trying. “Jump, jump!” her little brain directs her body. Her legs aren’t quite jumpers just yet, but she smiles nonetheless, excited to be all stretched out. 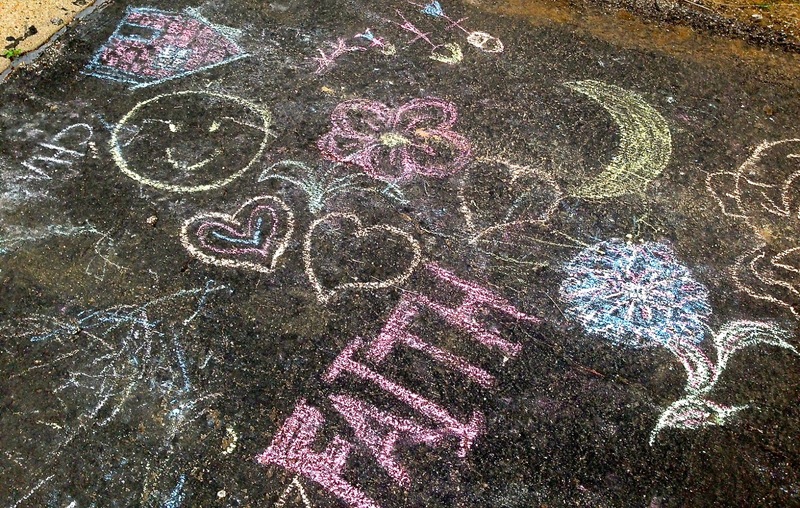 As shade hugs chalk, a bouncing Grandma, and a toddler stretched to the sky, I listen and hear old souls and little souls pulsing with new life. What a wonderful visual! Thank you for sharing this today. I was very moved by your words and my mind could really feel your story! Visiting from FMF. Love the imagery of \”old souls and little souls pulsing with new life\”.